January 26th, 2016 | News and Events, Wheaton World Wide Moving. Direct Lease Driver of the Month, Delroy Robinson, Waterbury, Conn., has 16 years of experience as a household goods driver. He maintains a top driver performance rating. 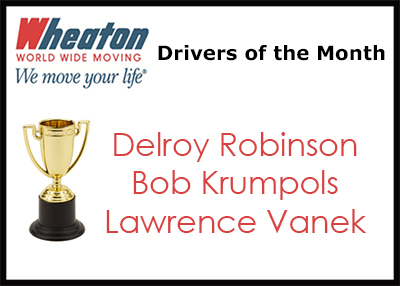 This is Delroy’s third Driver of the Month award. Bob Krumpols, Preferred Movers of TN, Inc., Crossville, Tenn., earned Wheaton’s Permanent Fleet Driver of the Month award. Bob has more than 32 years of experience as a professional household goods driver. This is his fifth Driver of the Month award. Bob was also selected as Driver of the Year in 2014 and is a previous American Moving & Storage Association Super Van Operator Award winner. Lawrence Vanek, Breda Moving Co., Inc., Roselle, Ill., earned Wheaton’s Intermittent Fleet Driver of the Month award. Larry has seven years of experience as a professional mover and this is his first Driver of the Month award.